The rake that started the revolution, the ultra-lightweight, patented Accuform Ace. 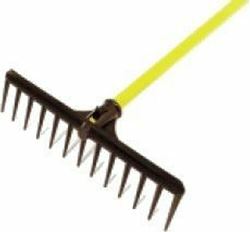 • The first rake with short-tooth tines on one side for raking and a special surface for smoothing. It eliminates bad lies in the bunker. • One-piece head, constructed of impact-resistant high-density polyethylene. • Available in 15 in. (38.1 cm) width and the tour-popular 25 in. (63.5 cm) width. 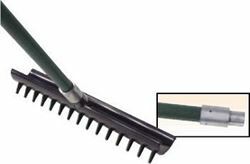 • The most widely recognized bunker rake in the world. • Preferred by top superintendents worldwide. Plastic head with 13 tines. 54" wood handle. 12 per carton. Replacement parts available. Also available with 15" head.